Photography is not just a profession. It isn’t something that can be easily learned. It is, like any other art form, born out of a passion. However, passion can be an expensive thing. This is why most of us photographers find that a little help from other resources can make our careers reach newer heights. Of course, photography is a resource and time-consuming activity. It requires a lot of investment in order to be at the right place at the right time. Owning the right equipment and being at the right locations for long durations just to get that single perfect shot are prerequisites, too. Considering the fact that this world has always had patrons of art, we today find ourselves in an era defined by photography grants or scholarships to help people who might not be rich, but have an eye for passionate photography.The following is a simple roundup of the best photography scholarships available today. However, apart from the ones mentioned here, there are many others if you can search for them in the right place. Please note that these grants more or less cover every domain of photography. However, the focus lies with editorial, photojournalism and documentary. The Aaron Siskind Foundation’s Individual Photographer’s Fellowship (IPF) endowment scheme supports and pushes artistic achievement in modern photography by supporting the creative accomplishments of artists working in still photography and photography-based media. The specialized Alexia Grant was not started up with the sole reason of rewarding the best photographers, as it is not put forth as a portfolio competition. The grant will be given away only to a photojournalist who can add to cultural understanding and world peace by thinking of and drafting a to-the-point, purposeful and consequential story proposal. The focus is to find a candidate who can display the aptitude to visually implement that story with persuasive images. The Foundation also makes available cash grants to facilitate student photographers to have the monetary ability to create a picture story that assists the Foundation’s goals of endorsing world peace. 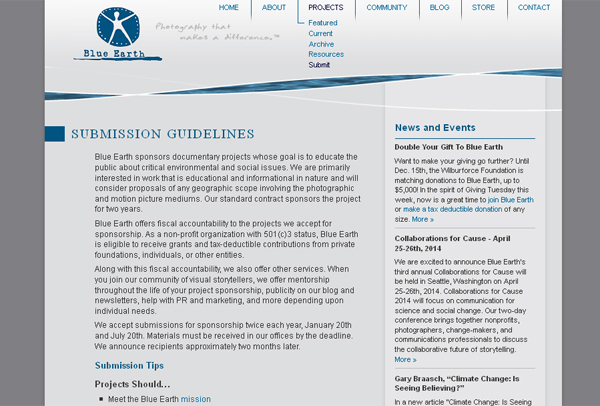 Blue Earth supports photographic assignments whose purpose is to inform the public about cultures in danger of extinction, environments that are dying or even recent issues of social worry. They are above all concerned in work that is didactic and informational in nature and will consider applications of any geographic connotation involving the photographic medium (they do not offer any grants to motion picture projects). Their standard agreement funds the project for two years. FFH offers a grant to non full-time photographers eager to take up photography as a career, but fail to do so because of financial limitations. The grant is up to US$5,000.In order to get this fellowship, the applicants are required to fill out an online application form that’s assessed and shortlisted. What follows is a comprehensive review of the portfolio, which settles the final award recipients. Editorial Photography Grant – This grant is available for professional photographers as well as students. They have been providing one scholarship of this type each year since 2005. The grant amounts to $20,000, plus editorial, logistical and promotional support. Apart from this, four student scholarships are also offered in the amount of $5,000 per year to photojournalism students at accredited schools. Grants for Good – This is a special grant, which is given away annually to two participants. The amount is $15,000 which is aimed to help students cover photographer, filmmaker and agency costs as they create gripping new imagery for the non-profit organizations of their choosing. 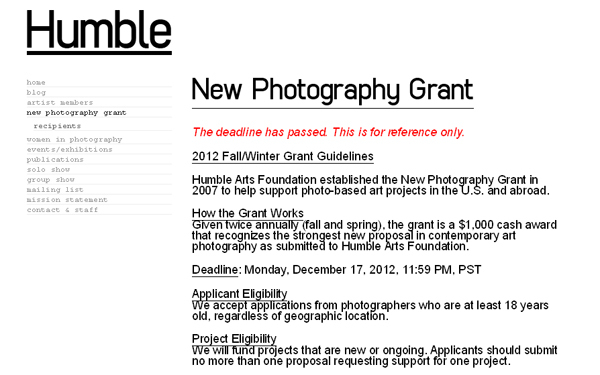 Humble Arts Foundation is well-known to have started the New Photography Grant in 2007 to help in funding fine-art photography projects in the U.S. and overseas. The grant is a $1,000 cash award given twice annually (fall and spring) that identifies the strongest, new applications in modern-day art photography, as submitted to Humble Arts Foundation. John Gutman made an impression as an artist and teacher on the development of photography as an art form for over 60 years. Through his benevolent kindness, annual awards of up to $5,000 are made to budding photographers showing professional achievement, stern artistic dedication and promise in the mastery of photography. 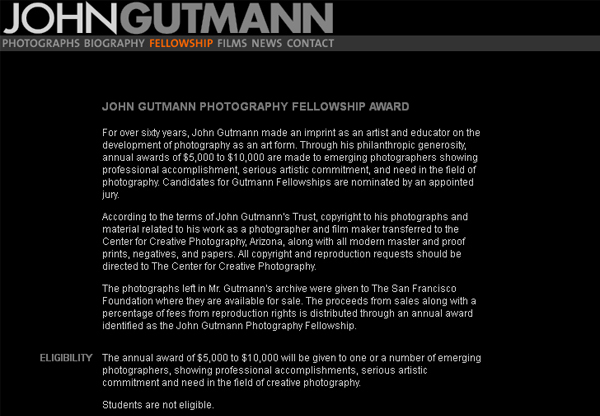 Contenders for Gutman Fellowships are listed by a prearranged jury.The annual award of $5,000 will be given to one or a number of candidates; however, students are not eligible. Also, the nominated photographer must be a U.S. citizen. The fellowship is only meant to be given to photographers. Nevertheless, the definition as to what represents photography will be at the discretion of the jurors. However, there are no guidelines for the usage of the reward funds. The Lucie Foundation is aimed at helping out professionals and rising talent who advance the art form of still photography with the medium of authentic subject matter, content or processes. They cater to a wide range of photography from photojournalism to fashion photography, digital to medium format, including every other class and subclass, so long as it meets their requirements. Their concern isn’t with type, but rather to promote innovative work and give support to an artist’s visibility through exhibitions of new work in an urban gallery setting. They also facilitate publication of the work in book format for exposure greater than before. 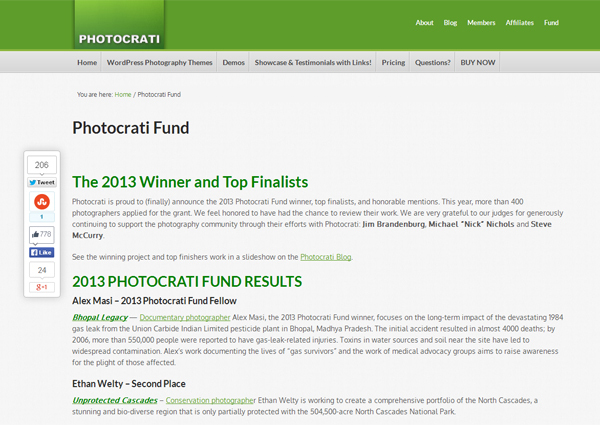 The Photocrati Fund presents a $5000 scholarship to up-and-coming photographers to commence significant humanitarian and ecological photography projects. Their goal is to recognize exceptional, promising photographers and give them the funds necessary to pursue projects that will have a substantial and constructive result on the world. Author Bio: This blog has been written by an international photo blogger currently associated with BrightTangerine.com. James Hill has wide experience in working with photography equipment and has trotted the globe for some of his best works.